Every cat is different in some way from every other cat, so we should try and avoid extreme generalisations. Having said that, Aby owners everywhere should recognise the descriptions below in the main. The Aby is a regal cat, and knows his or her place (at the top of the hierarchy - you are one down from that!). 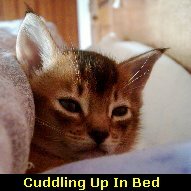 A well-bred cat will sit upright, with their tail curling neatly around the base of their body, keeping the toes warm. The cat should always be striking in appearance. 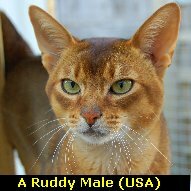 For some Abyssinian breeders, there is only one colour (known variously as usual (UK), ruddy (USA) or tawny (Australia)) - this was the only colour recognised for many years. Many more colours are now accepted, depending upon the country and registration body concerned. 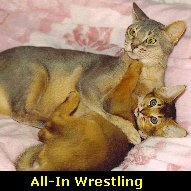 The Aby is a medium sized cat, of 'Foreign' type, but the type and colouration of show cats can vary noticeably between countries. 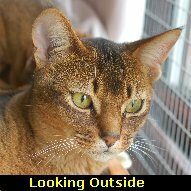 Photos of Abyssinians can be found by using the Photos link to the left. 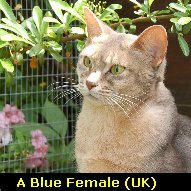 The typical Aby is an alert and intelligent cat who loves the company of people, but often finds the company of other cats less than ideal - they can be quite jealous of your affections! In a multi-breed household they are likely to claw their way to the top! They like being the centre of attention, but are not overly loud, sometimes miaowing but rarely chatty. 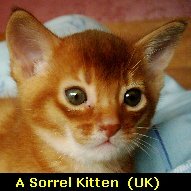 They do have a special trilling miaow, often reserved for playtime. They have the knack of leaving a tail draped down across the TV or monitor screen, and most will retrieve paper balls or furry mice if you throw them in play. The concept of sharing is not understood, however. Smarter than the average cat, most figure out door handles pretty quickly, and nearly all are expert in the art of theft (not necessarily silently, however). Some Abys will sit and watch you intently performing tasks such as operating a cupboard or door latch, then attempt to replicate the task when they think you're not watching. Most Aby breeders have to replace standard door handles with 'cat-proof' equivalents.